While it might not be the bike Tom Boonen will ride when he vies for victory in the cobbled classics this year, as he generally opts to use and S-Works Tarmac or Roubaix in those races, this custom painted special edition ‘Tornado Tom’ Venge will be the bike the 34-year-old will use for most races this season. 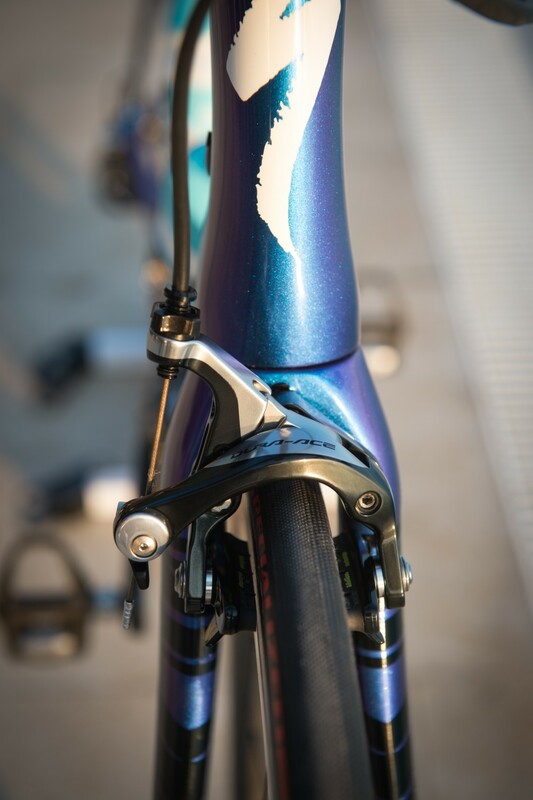 We took a chance to take a closer look at Boonen’s custom painted aero machine. The first thing to note about Boonen’s Venge is the sheer size of it. Standing at 6’4″, the Belgian requires a 61cm top tube to fit his big frame, but uses the head tube of a 58cm equivalent in order to get as low as possible. The custom paint job is inspired is inspired by his nickname ‘Tornado Tom’ and is supposedly colour changing, so it looks different depending on how the light hits the bike. Boonen’s setup is fairly standard throughout, but he uses a logn 140mm FSA SLK carbon stem to add to his reach, with some pretty narrow bars for his size at 42cm. 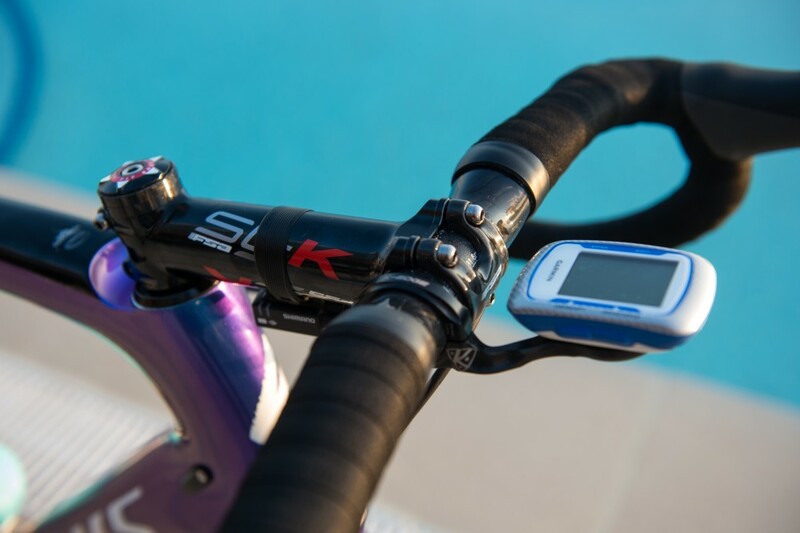 Boonen uses a K-Edge out-front computer mount with a Garmin 500 head unit. 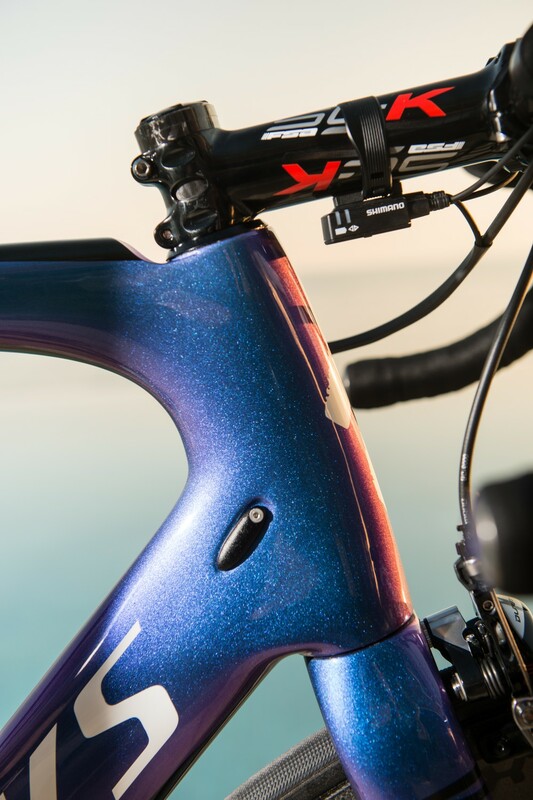 The tapered headtube on Boonen’s Venge is sized and shaped specifically for aerodynamics. His Etixx- Quick -Step team have now switched to using Shimano components having used SRAM previously, which you can see with the use of Dura-Ace brakes. The switch away from the American components manufacturer also sees the team drop Zipp wheels, using Specialized’s own Roval wheelsets for this season. Etixx will use FSA chainsets for the 2015 season alongside the Shimano components. Here Boonen is using a 53/39t K-Force Light carbon chainset. 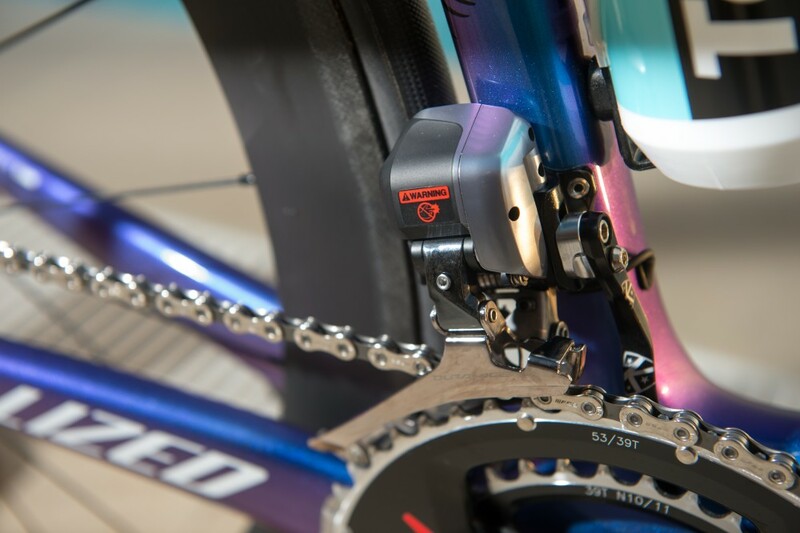 Having used Look pedals last year, note that the team have switched to Shimano with Boonen’s bike sporting Dura-Ace pedals. 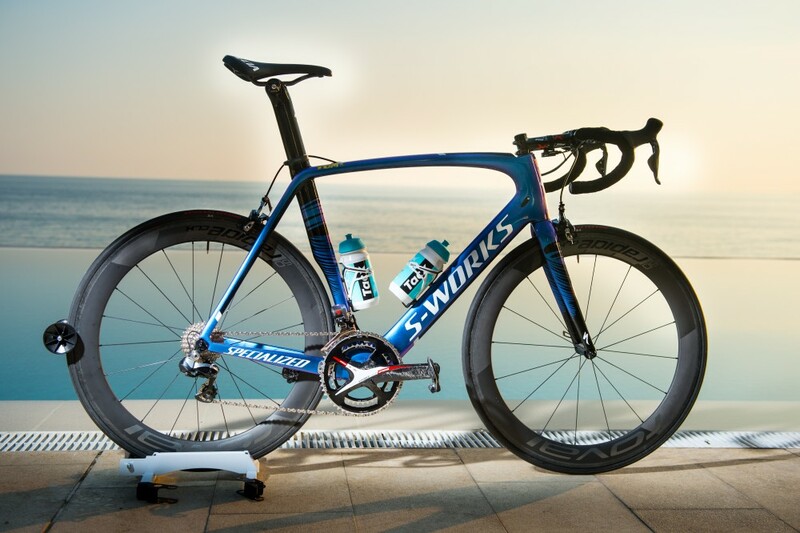 Despite SRAM looking like it’s about to produce its first electronic groupset, Boonen and his Etixx teammates have made the jump over to Shimano’s Dura-Ace Di2 electronic groupset for the 2015 season. 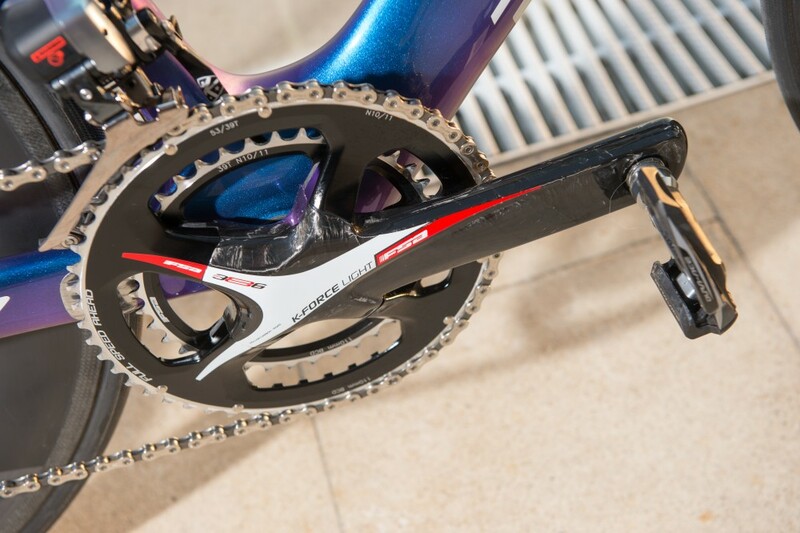 At the time of shooting, Boonen was using an 11-28 cassette on the rear alongside his standard chainset. Boonen’s Venge was race ready when took a look at it, with a race number mount already on board. Supposedly Boonen’s Specialized Romin saddle comes with extra padding to suit his preference. Under that padding is a carbon-reinforced nylon shell mounted on carbon rails. 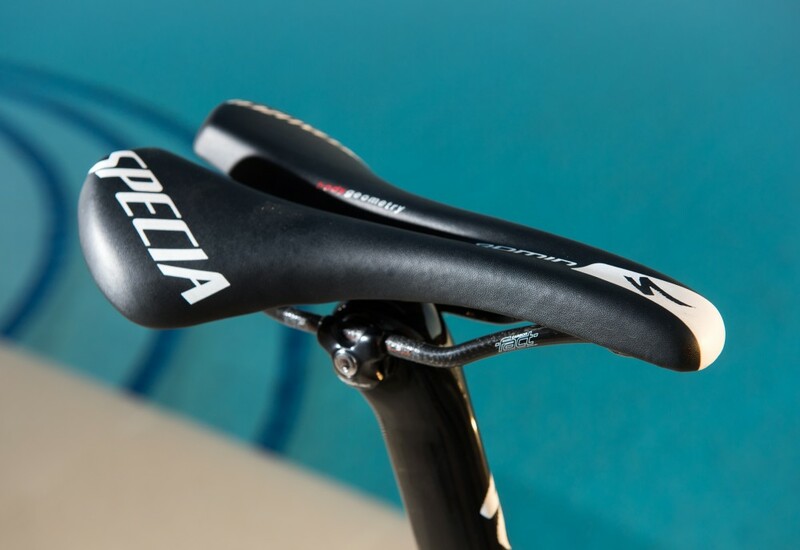 The saddle sits atop the aerodynamic Specialized carbon seatpost. 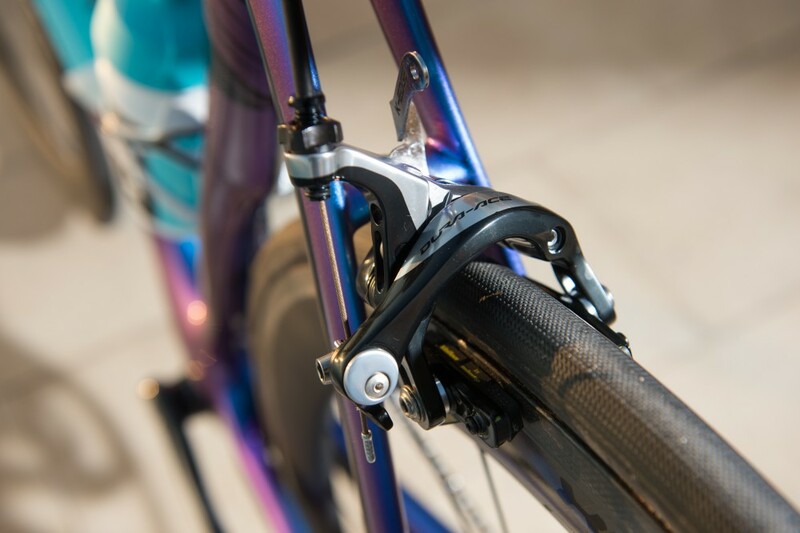 Boonen will get smooth shifting upfront on the bike his currently riding in the Tour of Qatar, with the Di2 front mech. The frame still sports remnants of the integrated cabling it would have had when the team was running SRAM Red last season. These have now been plugged as (thankfully for the mechanics) the integrated cabling is not longer needed.